Scene: The class is enjoying some silent reading time, and they’re all cute and comfy since they’re wearing their pajamas for a special school-wide reading day. One little dude, I’ll call him Fozzie (yes, because he reminds me of the bear from the Muppets), is sitting near me as I work on something. He begins to chat with me and gets away with it since he’s highly entertaining. Fozzie: Miss HasBrouck, what’s the worst mistake you ever made? Me: Oh, gosh. I’m not sure. I’ll have to think about it. Do you know the worst mistake you’ve ever made? Fozzie: Oh, yeah. For sure. Me: Do you want to tell me the story? Fozzie: Umm, well, it’s personal. Me: You don’t have to tell me. . .
Fozzie: (with a little smile) Well, ok. So, one day my mom sent me upstairs with her key to use the restroom and I tried and tried to get the door unlocked and I just couldn’t. I was turning it and twisting and pushing and, yeah, well. . . I pooped my own pants. Cue the giggling for both the student and the teacher, who really didn’t see that one coming. And the conversation could have ended there as a pretty good story. But it kept going and really went for gold. Me: Wow, that’s a bummer, Fozzie. I, um, don’t even really know what to say. So, what lesson did you learn from that big mistake? Fozzie: Righty tighty, lefty loosey. My brother taught me afterwards. Cue the out-right laughter from the teacher that distracted the entire class. 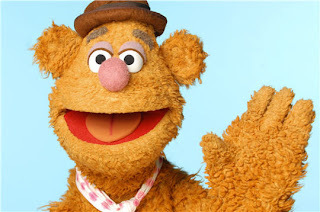 Fozzie’s one funny bear. And here I was so sure that a blog post advertised with “wocka wocka” would involve rock climbing. Oh well, you’re thoughts are never disappointing friend!